The little cloud's increasing. . .That arose upon Mow Hill." 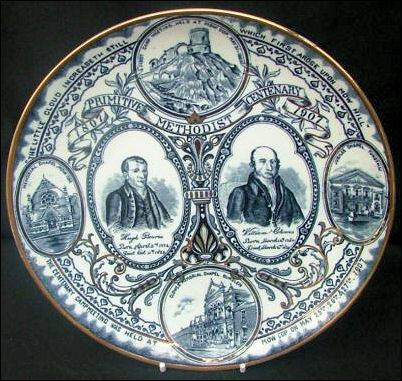 There are many monuments to the Master Potters of Stoke-on-Trent, these are found in the statues of Wedgwood, Minton and Campbell. 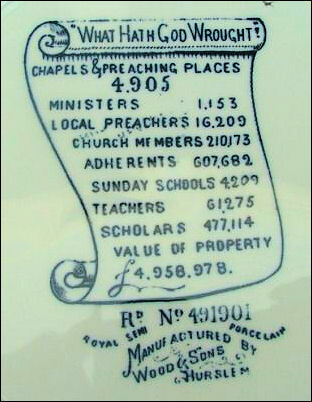 There is also Wedgwood Place, Spode Street, Aynsley Road, Meigh Street. Smith Child Street and Nash Peake Street recall local philanthropists and Ricardo Street, Villiers Street and Peel Street in Dresden honour local and national politicians. Bennett Street, Card Street and Riceyman Road exist in memory of the writer Arnold Bennett. this is the story of the Primitive Methodist Church - the Burslem Wesleyan Circuit Quarterly Meeting, who put Hugh Bourne out of fellowship on 27 June 1808, because of the camp meetings at Mow Cop, had no idea what they had started. What is Primitive Methodism? And when and by whom was it started? 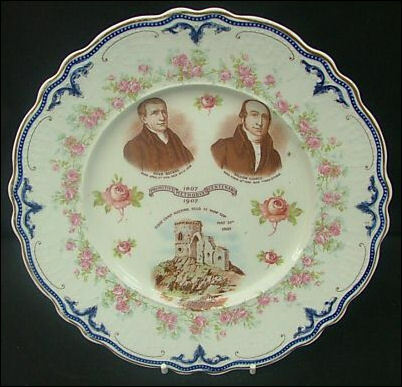 The two founders of the movement are without doubt Hugh Bourne 1772-1852, and William Clowes 1780-1851. But before we look at these two individuals we need to briefly trace the history of Methodism. The Methodist church was founded by John Wesley 1703-1791, John like his father was a clergy man in the Church of England, however he was a non conformist, and although he approved of organisation he felt the church was not doing all it should in reaching out to the people. John Wesley became a travelling evangelist and spent a lot of time in America, during the early evangelistic revival of the 1700’s John began to organise meetings and groups of people into what is now the Methodist Church. After his death in 1791 the church began the usual internal bickering and started to go away from the teachings and basic principals that Wesley had established. In 1800 there were no Churches on Mow Cop, the Anglicans showed no interest in the area and the Methodists had reverted to just staying inside their own churches - open air sermons as established by Wesley has died off. Hugh Bourne described the people of Mow Cop and Harriseahead as a bunch of godless people, and stated that you could not walk the area without physical or verbal assault. And so in 1801 he held prayer meetings at Pointon's Farm, which was to be the site of the very first camp meeting. Bourne had no idea how popular these meeting would become and before long there was not enough room in the farmhouse. He promised the people that they would one day have a full day of prayer on Mow, thus began the camp meetings and the birth of Primitive Methodism.